Higher education is central to achieving individual economic success and to supporting the national economy. It not only offers the most dependable path to achieving social mobility, but it also allows the United States to remain competitive in the global economy. For the thousands of undocumented young people who graduate from American high schools each year, the path to a college degree or a postsecondary credential is overshadowed by the complex state, federal, and institutional policies that determine available education options. Approximately 80,000 undocumented youth who have lived in the country for at least five years turn 18 every year, and about 65,000 of them cross the stage to graduate high school. These undocumented students are not eligible for federal financial aid, and many states do not allow them to pay in-state tuition rates. Undocumented students are advocating for greater access to affordable and high-quality higher education, and students, families, and policymakers across the country are demanding the same. 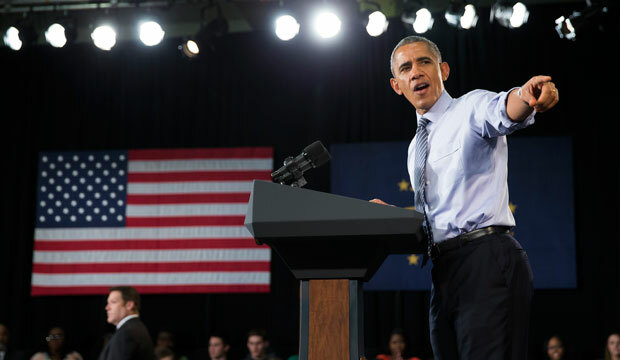 In this context, President Barack Obama announced his America’s College Promise plan to provide free community college to all who are willing to work for it. “We don’t expect anybody to be bound by the circumstances of their birth,” President Obama said in his speech outlining the plan. “And the way we deliver on that is making sure that our education system works on behalf of every person who lives here.” His announcement made clear that free education is important for everyone living within the nation’s borders, leaving open the possibility that his plan applies to undocumented students. In the weeks following the president’s announcement—and further acknowledgement in his State of the Union address—the Center for American Progress announced the beginning stages of its College for All proposal. The plan, which is still in development, builds on some of the same themes as the president’s plan—including the assertion that everyone, regardless of income, should have access to postsecondary education. However, its focus looks beyond community colleges to ensure that every student attending a public two- or four-year university does not have to pay upfront for tuition and fees at the time of enrollment. The plan also reforms the way students apply for financial aid and, in the case of student loans, streamlines services through the tax system in order to reform loan repayment. College for All would provide families with an early guarantee of aid and allow them to repay loans through payroll withholding, while offering more generous aid and repayment terms than those of the current system. While details are still forthcoming, CAP believes that the central tenets of College for All should apply to all students without restriction, including undocumented students who have grown up in the United States. Many undocumented students who have grown up in the United States often are not aware of their immigration status until they apply to college. While their friends learn that they are eligible for grants or loans, undocumented students learn that they cannot access federal financial aid and that their state may not offer them in-state tuition. Indeed, some schools welcome undocumented students, while others do not. And with high schools lacking college guidance counselors—many public high schools have an estimated ratio of 1 counselor for every 500 students—many counselors may not have the knowledge or time necessary to help undocumented students. Furthermore, these students experience poverty at twice the rate of students with U.S.-born parents, making it unlikely that their families have saved money for their college education. It is also unlikely that they can afford the high and ever-increasing cost of tuition, especially without access to in-state tuition rates and federal grants and loans. While available data on undocumented students and higher-education attainment are limited, it is clear that undocumented students have significantly greater trouble pursuing higher education than their U.S.-born counterparts. Undocumented students are significantly less likely to finish high school: 40 percent of 18- to 24-year-old undocumented students do not graduate, compared with 8 percent of all students nationwide. Given cost constraints, a majority of undocumented students who do complete high school attend lower-cost community colleges, which often have lower completion rates than four-year public colleges, lowering students’ chances of completing. Financial stresses also contribute to lower bachelor’s degree completion and extended completion times. Since the 1982 Supreme Court ruling in Plyler v. Doe, the United States has been legally required to finance the education of all students in grades K-12, regardless of their immigration status. This is not the case in higher education, although some states provide more support than others. Currently, 20 states offer in-state tuition rates to undocumented students through state legislation or actions by state university systems, and many other states have proposed similar legislation. Four states also allow undocumented students to access state-sponsored education grants or financial aid. But nine states have restrictions on tuition equity. Restricting access to higher education wastes students’ talent and potential. As gains made in the postsecondary attainment of competitor countries outpace gains made in the United States, America needs to do more to increase its college-going and high school graduation rates. The nation can accomplish this by prioritizing the attainment of populations that have the greatest room for growth. College for All should apply to all students. This would allow undocumented students in citizenship limbo to have access to public higher-education institutions and federal grants and loans. Under College for All, undocumented students could be eligible for accessible, affordable postsecondary education, but further congressional action needs to be taken. This would increase attainment rates, giving undocumented students the ability to succeed and to become the social and economic participants the United States needs to guarantee a prosperous future. Antoinette Flores is a Policy Analyst on the Postsecondary Education team at the Center for American Progress.